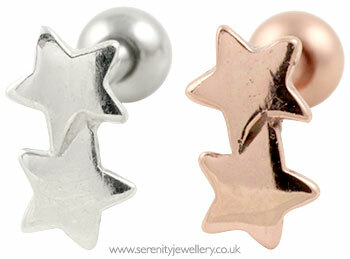 Two 3.5mm sterling silver or hypoallergenic surgical steel stars on a surgical steel 6mm or 8mm bar with 3mm screw-on ball closure secured at the back of the ear. I bought this along with a couple of other items to complete a look for a night out. Really pleased with the way they look on the tragus piercing and made of good quality. This looks lovely in the ear. I have mine on my upper ear and it really stands out. Recommend this to anyone. Earring looks exactly how it is in the picture. Lovely comfortable fit. I bought 3 studs that had sentimental meaning behind them. I searched everywhere locally to find something suitable, so when I found these I was very happy. 8mm for my helix piercing fits nicely. Service from Serenity was good as well. Thank you. I'm very sorry to hear that. 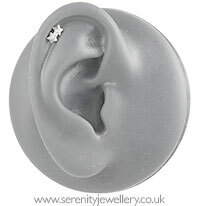 The ball screwing onto the back can make these styles rather fiddly with tragus piercings. However you might find wearing a pair of close fitting latex/latex-free gloves will give you a better grip of the ball so that you can screw it on.